I think it’s pretty safe to say we all have emotional challenges over the course of our journey through this life. From the spiritual novice to the most evolved spiritual leaders. The emotional challenges are unavoidable. More importantly, I have found that they create necessary growth and change. Those challenges can occur with emotions such as depression, anxiety, anger, fear, disappointment, grief, loss and the myriad of other emotions that exist. I’ve experienced emotional challenges in my relationships with friends, co-workers, family, self, and people I’ve dated. Many of my emotional challenges have been tied to the people who I love the most in my life. Or at least it hurts more with those people. It is more challenging I guess because of the close ties. I have discovered that my emotions are directly linked to how I feel physically. The mind/body connection. In other words, my pain, suffering, and other emotional challenges have been a direct result of my thoughts, fears, anxieties and behaviors. This makes it important for me to be aware of those thoughts, stresses, anxieties, and behaviors. I am finding that the more I learn to control these things, the fewer emotional challenges I face and therefore am able to live in a more optimal state of being. 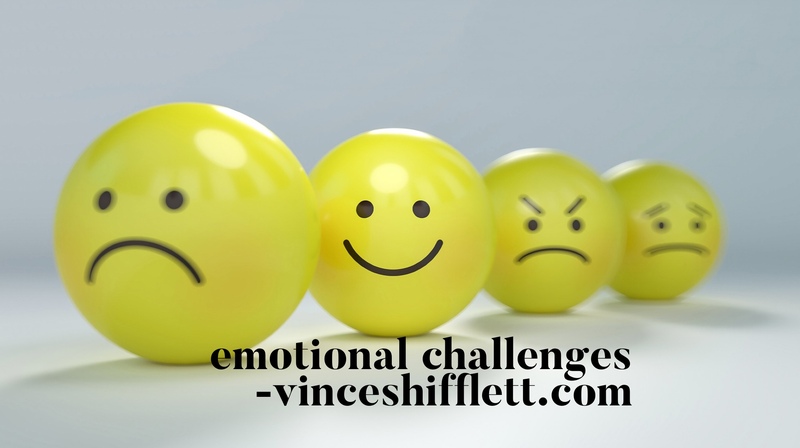 How do I handle my emotional challenges? Growing up as a child my Dad would always say, “crying is for sissys.” I can still hear him saying it at times. It had a pretty profound effect on me. Emotions were to be suppressed or hidden. I kinda got used to retreating to another place mentally and ignoring the emotion. I still find myself doing that at times even though I know that suppressed emotions lead to physical sickness. There are no words in the Universe to explain the emotional challenges I faced when I suddenly lost my mother in a car accident. Challenges of grief, loss, depression, anxiety, over-whelming sadness, and anger just to name a few. I really cannot explain all the emotional challenges I have allowed to penetrate my energy field over my lifetime thus far. From simple challenges such as being frustrated with a co-worker and disappointed in a family member or friend to pure anger over a given situation or person. So again, how do I handle those Emotional Challenges? While I am still learning how to handle my emotions, I would like to share a few helpful tips that have created some change and stimulated self-healing for me. Be Still: I have learned that no reaction is at times the best reaction. Being still is part of the allowing. Breathe: Inhale the emotion in then exhale the emotion out releasing it. The practice of breathing and focusing on that breath creates a deeper peace for me when I am able to accomplish it. Practice mindfully letting go as you exhale. Focus on your Spiritual Being: It is so easy to get too much in the human mind and the 5 senses of what we touch, smell, taste, see, and feel. We are actually spirits in a human shell but I find myself getting that twisted every now and then. The routine practice of meditation and prayer aids in putting me back in touch with my spirit. It only works for me however when I am consistent with that practice. This life is one big ole classroom for me. I am learning daily. Learning about me. I am indeed a work in progress and am acutely aware of the areas I need to continue to work on and grow. How do you handle your emotional challenges? I would love to have you share your thoughts. Until next week, Allow, Be Still, Breathe, and Focus onSpirit.You’ll be better equipped to handle your emotional challenges. I would recommend daily meditation. It works for me. Thanks for your response. Daily consistent meditation has been shown in research to be effective for many things. I am still working on the consistency part. As a person who is learning to embrace his emotions and to abdicate the fear of experiencing them, I sincerely appreciate this blog that you’ve shared with me. Even though my emotional intelligence is truly blossoming and becoming more solid, I still have those days where I feel like that little boy that no one was willing to listen to or to protect. In fact, I’ve learned that many of my emotional disconnects stemmed from those exact situations. I will Allow. I will Be Still. I will Breathe. I will Focus on my Spiritual Being. I Love You and send love and light your way! Thanks for your beautiful response. Life is a journey for us all. The ebb and flow of life is real. I’m so happy and proud for your evolvement. I look forward to more feedback and hope we can get together soon to share a meal. First let me say how grateful I am that you took the time to respond. I love that you talk about how our emotions can “make or break” us. So true and I e experienced both the making and the breaking. I look forward to hearing more from you and hope you have an amazing week. Vince this is very helpful. Although it’s been less than a year since I lost my daughter in a tragic car accident I get very emotional EVERY day.. I will utilize these steps.. Thanks for the encouragement.. Much love Brother. First, thank you for your vulnerable response. There is no time limit on grief. Take the time you need to grieve without having any expectations on yourself about when the grieving should be over. So sorry to hear about your daughter. I cannot imagine what it must be like to lose a child and particularly the way you lost her. Please know that in your grieving, her spirit is alive and well. Her physical body is gone but her spirit lives on and you can commune with her spirit. Sending you lots of love and light during this time. If you need to talk, I am here. You can send me an email and I will send you my personal phone number. I want you to know, I am here to listen should you need me.